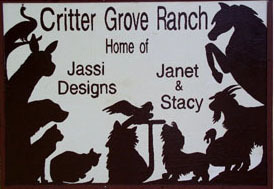 Janet & Stacy moved south in 1999 and have since created Critter Grove Ranch in the Missouri Ozark Mountains. There we have adopted or found homes for dozens of dogs, cats, and horses and truly have a place filled with love. But Janet had a 30 yr old dream--living on a mountain (in our case a hill) and raising goats. But not just any goats! 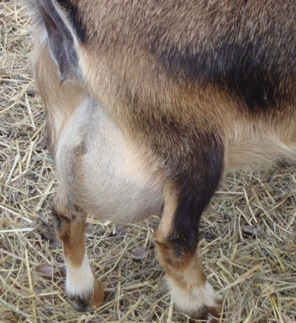 The adorable, colorful, and carefree Nigerian Dwarf Dairy goats. We started with high quality in both dairy production and show confirmation, buying our original 5 does and 1 buckling from www.PrairieWoodRanch.com in New Mexico, who excels nationally in both show and dairy production--with the added benefit of BLUE EYES! And we try to continue that tradition with hopefully all that plus-- cool coloring. 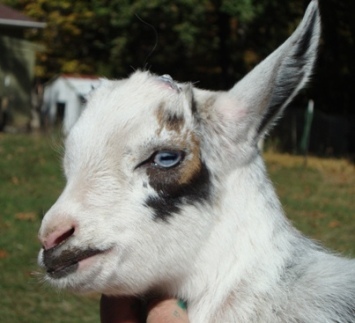 We don't have a very big operation, but I personally think we have some of the prettiest goats around--and the pretty face and color is always backed up with all the necessities. We are proud of what we raise and glad to share them with others. Check out our For Sale page if you want to or have--become a ND junkie.